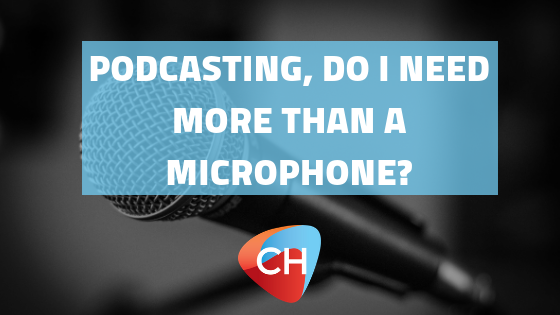 Podcasting, do I need more than a microphone? Podcasting, do I need more than a microphone? – A guide to mixers & audio interfaces. This is a question we get asked a lot, and normally for a single person podcast the answer is no. USB microphones have vastly improved over recent years and so if you have a Blue-Yeti, an ATR2100 or other USB microphone, then you won’t need anything else really. However, if you are looking at adding in more than one microphone to your podcasting set-up, more than one voice or adding additional recording elements then you may need more than just the microphone. Buying two USB microphones and hoping to record into one PC or MAC can be very problematic as you often have to “hack” your soundcard to split into two so that you can record with both. It also causes major problems if the two USB microphones are the same brand or make (the machine cannot distinguish between them), not great for podcasting. Scarlett 2i2o – A perfect audio interface for 2 microphones and a great sound. This plugs into your machine with a USB and allows for 2 XLR inputs and 2 jack outputs to monitors. It can also provide phantom power to those more expensive microphones that might require it. Behringer XENYX – A cost effective mixer that can handle up to 16 inputs, great for recording live music or panels if you want to mix the gains and FX before it records the audio. However, this model can only record on 2 tracks separately via USB interface into your machine. Zoom H4N – A cost effective recorder that records directly onto SD or memory. Perfect for recording out in the field. It includes 2 microphones on board for quick interviews. As well as 2x XLR ports for plugging in microphones to record on separate channels. You don’t need to plug into a machine for this one, which can also be a benefit in the studio if you suffer from “screen hum” whilst podcasting. Another great bit of kit for those wanting great quality when out and about is an adaptor to use a microphone with your phone. Obviously the latest iPhone doesn’t come with a built in XLR. But for an affordable amount adapters like the iXZ from Tascam can make recording very easy, and give you high quality audio wherever you go. Want to read more about getting started in podcasting?